Star Wars Celebration is bringing us a lot of news, both good and bad, about the upcoming Star Wars movies. While there has been plenty of good news, we do have to report a bit of sad news for fans of Carrie Fisher. Lucasfilm President Kathleen Kennedy has confirmed that the late actress will not be appearing as Leia Organa in Star Wars 9. The news came courtesy of ABC NEWS, via Good Morning America, that Carrie Fisher will not be appearing in any way in Star Wars Episode IX, which is currently slated to hit theaters in summer 2019. The legendary actress passed away in December, though, she had already finished filming her scenes for the upcoming Star Wars: The Last Jedi, which we now know will mark Carrie Fisher's last appearance as the iconic character. Here is what Kathleen Kennedy had to say about it. "We finished everything [with Leia] in Eight, and Carrie is absolutely phenomenal in the movie. And we're so happy that we were able to complete shooting in the summer. Unfortunately, Carrie passed away. So, by the time we were well underway with Episode Nine, in our thoughts we had not written the script yet. But we've regrouped. We started over again in January, so, sadly, Carrie will not be in Nine." 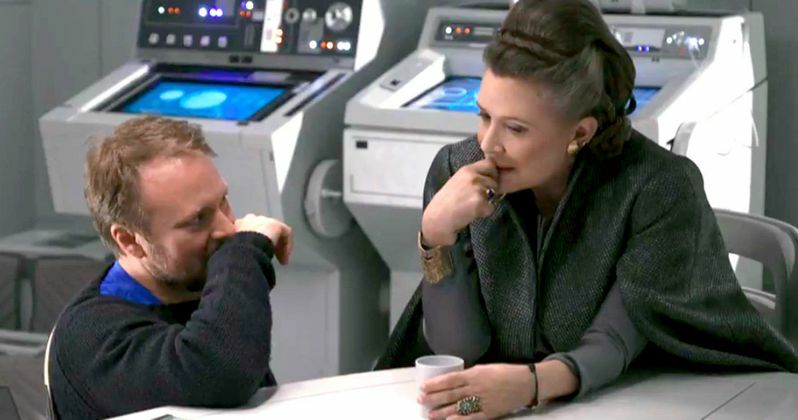 For some, it may seem fairly obvious to say that Carrie Fisher won't be appearing in Star Wars 9 at this point, but there was reason to think that she might. Initially, it was thought that Lucasfilm may try and recreate her likeness using CGI, like they did with Grand Moff Tarkin and a young Princess Leia in Rouge One: A Star Wars Story. That was taken off the table fairly early on, with Lucasfilm releasing a statement saying they wouldn't go down that road. But just last week it was reported that permission had been given by Carrie Fisher's brother Todd Fisher and her daughter Billie Lourd to use previously shot footage that wasn't used in Star Wars: The Force Awakens and Star Wars: The Last Jedi for the movie. However, it looks like that won't be happening either. Here is what Todd Fisher had to say about it. "Both of us were like, 'Yes, how do you take her out of it?' And the answer is you don't. She's as much a part of it as anything and I think her presence now is even more powerful than it was, like Obi Wan, when the saber cuts him down he becomes more powerful. I feel like that's what's happened with Carrie. I think the legacy should continue...I'm not the only part in that equation, but I think the people deserve to have her. She's owned by them. You don't mess with this legacy. It would be like rewriting the Bible. To me, Star Wars is the holy grail of storytelling and lore and you can't mess with it." It looks like the other parts of the equation have decided that it is best not to mess with Carrie Fisher's legacy and they will be leaving Leia out of Star Wars Episode IX. That does raise a lot of questions moving forward. Most notably, how they will deal with her absence in the movie. Her death wasn't part of the plan in Star Wars: The Last Jedi and it has been said that her performance will be presented as originally intended and won't be altered. That means that director Colin Trevorrow, who is signed on to helm Star Wars 9, will have to work with Lucasfilm to find a way to explain her absence. Kathleen Kennedy say "We'll see a lot of her in 8," which is very good to hear since it will be last time we ever see Princess Leia on screen. We can just hope that they will find a respectful and satisfying way to close out her character's arc in the movie. Star Wars Episode IX is currently set for release on May 23, 2019. You can check out the interview clip with Kathleen Kennedy for yourself below.